Medb, Celtic Sovereignty Goddess of Connacht, the wilderness in the Irish west, ruled war, fertility and the earth. A man became king of Connacht only by participating in a ritual of intoxication and entering into sacred marriage with Medb at Connacht’s mystical center, Tara. She had an insatiable sexual appetite, taking men as she pleased and marrying at least four, who became King of Connacht in their turn. Her first husband was probably King Conchobar of Ulster, with whom she had seven sons and later became her mortal enemy. With Aillil she had three daughters. Medb, translated as “strong” or “intoxicating”, drove men wild with desire at the mere sight of Her. Indicative of Her connection to the earth and fertility, She clothed Herself with live birds and animals across her shoulders and arms. Further evidence of Her strength, sexuality and passion lies in Her ability to run faster than any horse. Medb claimed to have originally come from, Cruachain, a site that the ancients believed held the entrance to the Otherworld. Queen Medb, most likely an aspect of the Goddess Medb, reigned during a time when Celtic women maintained a status of freedom and equality not granted to women in most other parts of the world. They both owned property and held important positions in society. Who ever possessed the most wealth in a marriage, could be considered the ruler of that household. 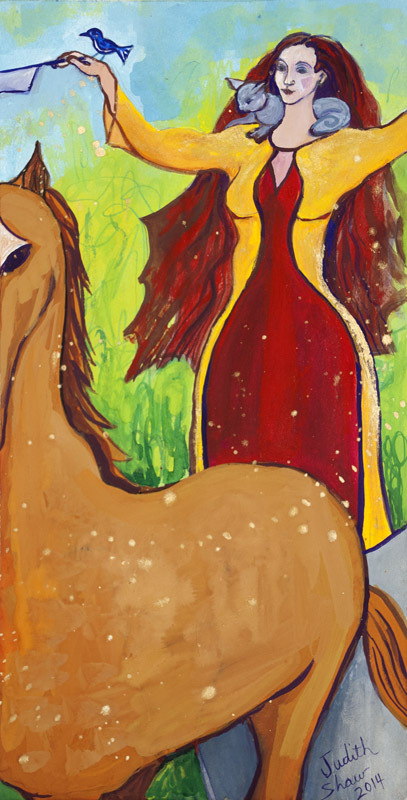 Queen Medb, more commonly know today by Her Anglicanized named Maeve, is a central character in one of the most important old Irish epics, the Tain Bo Cuillaigne, or the Cattle Raid of Cooley. Characters and actions from other Irish tales come together in this story. The curse of the Goddess Macha/Epona on the men of Ulster, Ailill who was so smitten by Etain, Lugh, God of the Tuatha Dé Danann, Cu Chulainn, the great Irish hero, and the Morrigan with Her blessings of life and death all appear in this extraordinary legend. This long, bloody event all began innocently enough one evening while Medb lay in bed with Her husband of the moment, King Aillil. Aillil, attempting to prove his superiority and maintain his position, claimed he had more wealth than Medb. On all counts they were equal until Aillil mentioned his ownership of the magical and incredibly fertile bull, Finnbhennach. Fennbhennach had actually been born into Medb’s herd but due to the changing values of the time, disdained being owned by a woman and thus transferred himself to Ailill’s. Medb, not one to accept defeat or an inferior position, determined to get the equally fertile bull, Donn Cuailnge from Cooley in the county of Ulster. After a deal broke down to get the bull by negotiation, Medb raised an army of both Her men and exiles from Ulster led by Her lover, Fergus mac Roich. They set out to capture the bull, Donn Cuailnge. Medb led Her men into battle. At first She prevailed, for upon sight of Her the men of Ulster fell down in convulsions of desire, unable to resist or fight. In addition, the Ulster men suffered from the curse of the Goddess Macha/Epona, who was also able to run faster than any horse. Because of this curse, in the hour of their greatest need they fell down as if pregnant with terrible labor pains, incapacitated for battle. Only the mythic Irish hero, Cu Chulainn, a mere youth at this time, was able to prevail against Medb, first with an unsuccessful guerrilla campaign, then by invoking the right of single combat at fords. Cu Chulainn received both help and obstacles from supernatural beings like the Morrigan and Lugh. After many months the story culminated in the final battle. In the beginning of this battle, Cu Chulainn who was recovering from his wounds, stayed out and Medb, with the help of Fergus mac Roich triumphed. But various conflicting promises and allegiances confused the issue and ultimately Medb and Her forces were forced to retreat. But She was not defeated. She achieved Her original goal, bringing the bull Donn Cuailnge back to Connacht. And yet this tale, which began with a comparison of wealth between the royal couple, ends with an ironic twist that canceled out the loss and the gain. Donn Cuailnge fought and killed Aillil’s bull Finnbhennach, but he was also mortally wounded and later died. After many months of battle and many deaths, Queen Medb and King Aillil were finally equal in wealth, but not in power. The power remained with Queen Medb, Sovereignty Goddess of War and Fertility. Medb brings us the awareness of the intoxicating power of passion. She personifies the passion of love and desire; of anger and war. Call on Medb to maintain balance and good intent with your passions. Medb opens the door to the acceptance of our own sovereignty, to owning our power, to claiming our truth. With Medb by our side, we can ride forth to battle those who would rob us of our birthright as fully sovereign beings. Oh I don’t know, I am not so starved for stories any more that I need this one–unless it is told again, backward and forward to a time when there is no violence and no war. In the meantime, I prefer my Goddess not to fight violence with violence. And though I have had a few intoxicated lovers in my time, is this an image we want for “love”? Thanks for this post. I named the narrative character of the Maeve Chronicles for Queen Medb. (Or rather Queen Medb named her in vision or dream encounter, ch 4 of Magdalen Rising.) I also spelled her name Medb in the first draft. Queen Medb is not always an easy or admirable character from a modern point of view. Many mythic figures male and female are not. My Maeve is more lover than fighter (unlike her daughters–see Bright Dark Madonna and Red-robed Priestess.) Queen Medb does stand for the sovereignty of women, something Maeve’s eight warrior-witch mothers impressed upon her at an early age and which she never forgot. Yes it is very true that Queen Medb and many other mythic characters are not easy for our modern sensibilities. 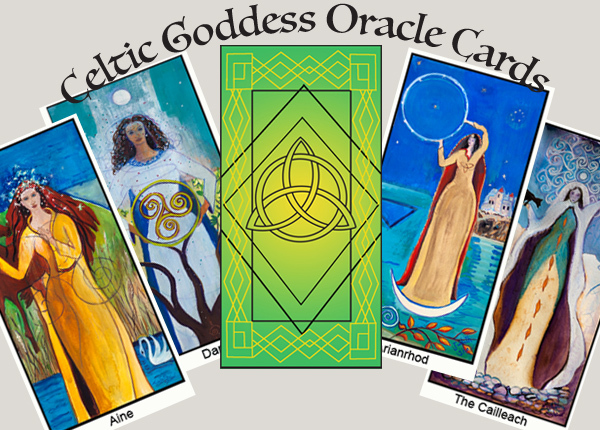 The Celtic pantheon has its fair share of warlike Goddesses and Queens who I have not approached in the past because of that. But recently I felt the need to explore that side of the stories also and Medb called out to me to speak of Her. I believe it is Her fight for her own thus for all women’s sovereignty that appealed to me. She is not a Goddess of Love. Passion and sexuality are sometimes different than love and She expresses that part of our nature – the wild, the untamed, and of course the sovereign. All this week I’ve been hearing different dire reports about the destruction of our ecosystem – from melting, dying starfish on the west coast of the United States to the injustice and environmental devastation on the NIger Delta. My heart aches for our Mother Earth. 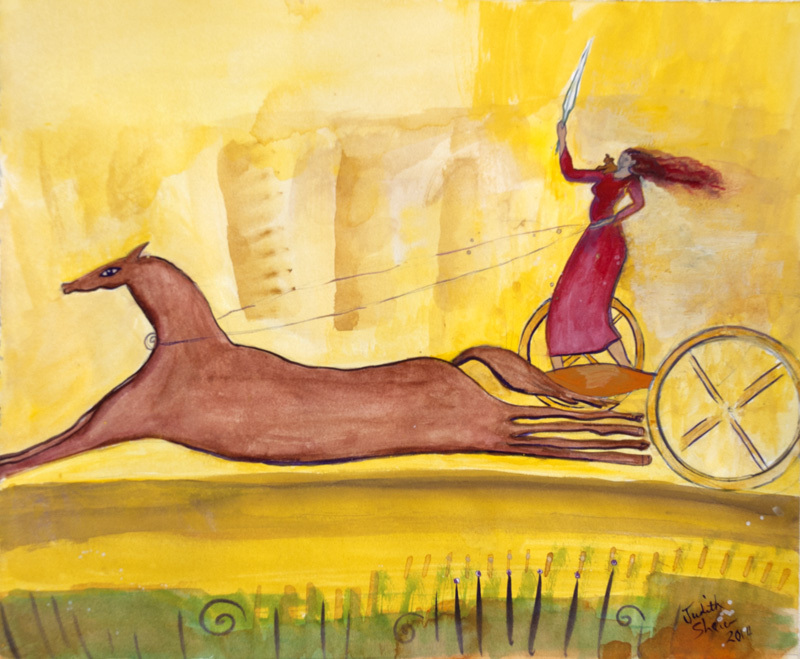 Medb came again into my consciousness and I felt called to create the second painting with Her riding forth to slay those who are determined to destroy us all in the name of their profits. As a peaceful witch it is difficult for me to acknowledge that I could bear arms myself if by doing so we could stop the destruction to our earth mother. I don’t know how we are going to stop it, or turn it around once we do stop it. There are very few things I could do violence for. This is one of them. I’m all for Medb. I love the idea of making love not war but in the present state of women’s conditions in the world it would be ludicrous to think we can simply lay down in a bed of love and achieve any kind of equality and fairness for the rights of women. We can use the adventures of Medb as an inspiration for the many battles we face now in our efforts to regain the sovereignty that is truly ours as women. Thank you for this post, Judith. I am inspired. Thanks to all for reading and sharing your thoughts. Carrie, your comments mirror my thoughts very well. The first appearance of Kāli in her present form is in the Sauptika Parvan of the Mahabharata (10.8.64). She is called Kālarātri (literally, “black night”) and appears to the Pandava soldiers in dreams, until finally she appears amidst the fighting during an attack by Drona’s son Ashwatthama. The fact that warrior Goddesses appear to soldiers in their dreams ought to give us pause. The Celtic culture was a warrior culture too, and its warrior Goddesses must also have appeared to soldiers in their dreams. I think we must distinguish between fighting for our rights and the frenzy of war. Frenzy of war is not the same as the wildness of nature. Both can be destructive, but one is part of the circle of life the other is not. My voice may be the minority here, but maybe it won’t always be. What would images of female strength and resistance look like if they were not modeled on war, warriors, and the frenzy of war? They would look like Elizabeth Warren, Eleanor Roosevelt, Sojourner Truth, Bella Abzug, Sonia Sotomayor, Ruth Nader Ginsburg, Elena Kagen, Dian Fosse, Rachel Carson, etc. etc. We should plaster their pictures over the nursery walls of every little girl in America. Heck, plaster the little boy’s nurseries too. I agree that there is a difference between fighting for our rights and the frenzy of war. I myself hold the emergence of a peaceful, loving world in my heart as I’m sure all of us here do. But I do still find value in exploring the many facets of the Goddess as She has come to us through the ages. Most all Goddesses existed before the patriarchy came into existence and were greatly changed through patriarchal retelling of their stories. Most all historical cultures were warrior cultures as was the Celtic culture. I believe The Morrigan (yet to be explored by me) did appear to warriors before battle but I think her appearance was usually interpreted as foretelling that warrior’s death (but there’s probably more to her than that). But Medb, before she became know as Queen Medb was a sovereignty Goddess. To me that indicates that she was a powerful Earth Goddess, worshiped before and during the transition to patriarchy. And even as Queen Medb, she went on the cattle raid in response to a threat to Her sovereignty. Is the Goddess not a metaphor for our human needs and experiences? I see the sovereignty of the Goddess/of women and the sovereignty of the Earth as one and the same. When I think of Medb and other warrior goddesses, I see Her/them personified by women like Anina suggested “Elizabeth Warren, Eleanor Roosevelt, Sojourner Truth, Bella Abzug, Sonia Sotomayor, Ruth Nader Ginsburg, Elena Kagen, Dian Fosse, Rachel Carson, etc.”. I look forward to reading Elizabeth Cunningham’s “Maeve Chronicles” to see how she has re-visioned Her.